Home > Safety > Dangers of Snowboarding: What Can Go Wrong? Gliding across snow-topped mountains with only a board attached to your feet may be an activity that many adrenaline junkies strive to be good at, but any sport with an injury named after it, needs to be taken seriously. One of the most common injuries when snowboarding is fracturing the talus bone in the ankle. This is an ailment now named Snowboarder’s Ankle because it’s 15 times more common in snowboarders than anyone else. More worryingly, it often masquerades itself as a twisted or sprained ankle but the symptoms of swelling and pain persist. If the injury is not diagnosed early, it can lead to subsequent joint damage and several weeks of crutches and prescribed rest. As a snowboarding novice, it’s inevitable there will be falls, even though the manoeuvres are simpler than those of a more experienced boarder. The problem is learning to maintain a stable stance on the board and grasping turning. As both feet are strapped to the board, it’s harder to adjust yourself as you fall, leaving your wrists and hands susceptible to the impact. Additionally, your hands are the first things to go out when hurtling towards a tree or other obstacle at great speed. As a result, wrist injuries are the most common snowboarding injuries and hard impacts can cause sprains or fractures. 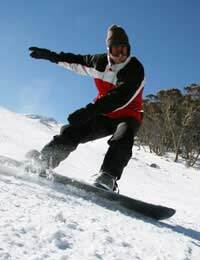 Lifts are that bit trickier with boards rather than skis, and it’s normal for boarder beginners to fall as they dismount them – one foot is loose at that point and has to balance on the back of the board, which is an acquired skill, so again falling backwards onto your hands is commonplace, potentially causing hand, wrist or forearm injuries. Collisions with other boarders or skiers are also regular occurrences on the slopes. It’s easy to lose control when you’re a beginner and you only need to look at video-sharing websites to see how many times snowboarders are taken out by out-of-control skiers and vice versa. When learning to turn on the board it’s essential to make sure you have a clear turning path and leave plenty of space when overtaking. If the injury itself isn’t bad enough, the trauma can be added to by then finding out you’re not properly insured. It’s no fun being confined to off-piste, nursing your aches and pains while watching your partner and friends enjoy themselves in the snow. But if you’re not insured for treatment, it could be very costly or you may just have to sit out the rest of the fun. According to the Foreign Office, a fifth of Britons now take a winter sports break and as the number of snowboarders increases, so does the risk of serious injuries. Out of that fifth, 31 per cent fail to take out adequate insurance, leaving them vulnerable to medical costs or, possibly, untreated injuries. A trip in the air ambulance could cost you £10,000 or more, so it’s worth reading the small print of your policy and making sure you are comprehensively covered in preparation for any accidents. The European Health Insurance Card (EHIC) will only work in countries that are full members of the EU, so a bit of research beforehand is key. Andorra for instance - which may be an attractive, low-cost snowboarding choice, may be in Europe, but it is not a full member of the EU so the EHIC is useless and as a result, you may have to pay extra for your insurance. Off-piste activities can also hinder your health in more ways than one. At high altitudes alcohol can have a much bigger effect, so a lunchtime drink may be more potent than you realise. What’s more, if you injure yourself under the influence, your insurer may not pay out. The best way to avoid mishaps when boarding is to invest in some protective gear. It may be a fashionable sport but protective clothing and helmets are starting to become a more familiar sight on the slopes (helmets, wrist and knee guards and various padding and protection are all available from ski stores) and buy good, comprehensive insurance in case the worst should happen. Take it easy and take it one lesson at a time, it’s much more fun if you don’t hurt yourself!